Saturday night, when the restaurant that we had wanted to have dinner at was packed and had a 45-minute wait, Flaneur and I decided our growling stomachs couldn’t stand the wait so instead we set off through the Lower East Side to find something else. In New York, finding something good is never hard and something great is never far. We hadn’t been walking for more than two minutes when we stumbled upon a cute, cozy tapas restaurant, A Casa Fox. 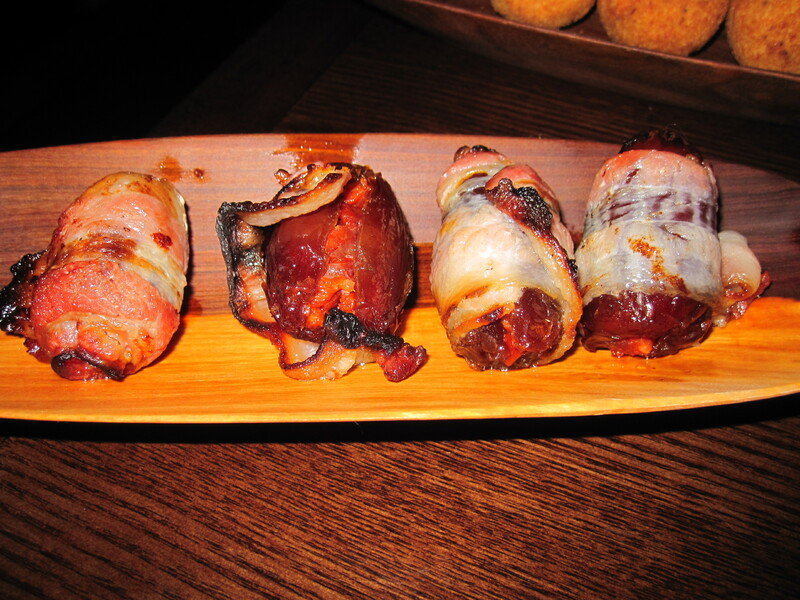 The latin-inspired menu had lots of great options in the way of small plates and we tried a good assortment of them but hands down, the most delicious thing we tried were the sinfully delicious, artery clogging, bacon-wrapped, chorizo-stuffed dates. Salty, spicy, meaty, sweet and chunky, they were without a doubt the most delicious thing on the menu and by far, the best thing I ate all weekend. A Casa Fox had great empanadas, nice tostones, and a pretty good arroz con pollo, but the dates? Those alone were reason enough to go back… again and again and again. This entry was posted in Dinner and tagged A Casa Fox, bacon, chorizo, dates, Lower East Side. Bookmark the permalink. YUM! Lets do a fun bloggable dinner together soon.